Find here some great tips for how to give new life to your bathroom, whether you are looking for a small fix or starting from scratch. Change out the towel bars. Make it the jewelry in your bathroom. Try a different metal, such as brushed nickel, and look for interesting shapes. Change the color. Paint the walls, or if the walls are tile, paint the ceiling a light shade. Another way to change the color is with different rugs and towels. Avoid brown in bathrooms! Colors that work well are sandy hues, peach tones, and light blues. Replace the showerhead. Try an environmentally friendly low flow showerhead. Some upgraded showerhead options are the “rain” style or one with adjustable massager that removes from the wall and can be used by hand. If installing a new bathroom, invest in multiple showerheads and body sprays. To add mood, try the Hansacolourshower, which uses LED lights to change the color of the water spray. Include a place to rest. Find some room to add a chair, whether it be a simple wooden stool or a chaise longue. Adding seating allows you to put in another dash of color in rooms that are normally stark white. Install furniture-grade cabinetry. You can upgrade your old cabinetry with new, richer stain and moldings and trim. If building new or remodeling, you can buy a new piece or have one specially made to match other furniture in your home. Cabinetry that looks like a bureau makes a classy statement. Choose a vessel sink. Vessel sinks are the perfect option to go with furniture-grade cabinetry. Depending on the style of bowl sink you choose, you can make the bathroom look modern or antique. In an antique look, the cabinet looks like a dresser with a ceramic bowl on top, mimicking the look of turn-of-the-century bathrooms. WIth a modern look, the cabinetry is smooth or chunky and the vessel sink can be made of metal, stone or glass and sport different shapes, such as square. Replace boring light fixtures. While you may still need task lighting and a fan, there’s no reason not to add spice to the bathroom with lights between the tiles in the floors or with a sparkly chandelier over the bath tub. Don’t forget to integrate romantic candlelight. Incorporate other water features. Bathrooms are equipped to deal with moisture, so add a waterfall feature to a sitting area or that flows into the tub. If you can’t go all the way with a waterfall, replace staid fixtures with new faucets from which the water will cascade out like falls. Build in fireplaces and TVs. 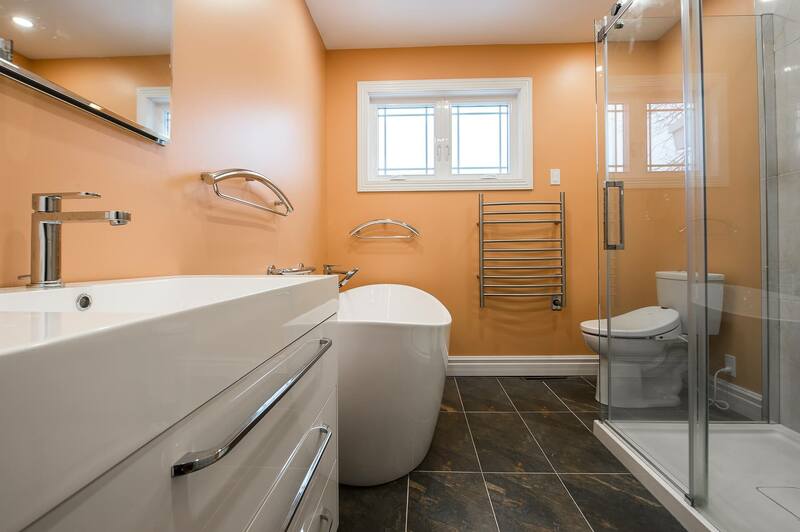 If you are really going to get the most out of your bathroom and make it a place where you spend time, lounging in the tub, you will want some creature comforts, such as a fireplace and large-screen TV. Incorporate some luxuries. Try a refrigerated medicine cabinet for storing cosmetics and medication, or warming drawers or heated towel racks so you don’t catch a chill when it’s time to dry off. Heated tile flooring or separate climate control for the bathroom are also excellent options. If you have the space, create his-and-her bathroom areas to keep you both moving in the morning.